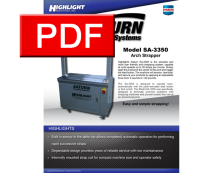 Highlight’s Saturn SA-3350 is the simplest and most user friendly arch strapping system, capable of cycle speeds up to 30 straps per minute. Simply align the product to the center of the arch and trigger the start button. The machine will tension, heat seal, and secure your products by applying an adjustable force from 5 pounds to 120 pounds. The SA-3350 is designed to operate semiautomatically with the push-activated start button or foot switch. The Model SA-3350 was specifically designed to eliminate common problems with strapping machines and provide trouble free use at an economical price.